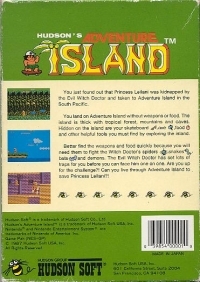 Box Text: You just found out that Princess Leilani was kidnapped by the Evil Witch Doctor and taken to Adventure Island in the South Pacific. You land on Adventure Island without weapons or food. The island is thick with tropical forest, mountains and caves. Hidden on the island are your skateboard, axe, food and other helpful tools you must find by exploring the island. Better find the weapons and food quickly because you will need them to fight the Witch Doctor's spiders, snakes, bats and demons. The Evil Witch Doctor has set lots of traps for you before you can face him one on one. Are you up for the challenge?! Can you live through Adventure Island to save Princess Leilani?! 03-10-2019 drakeshockfire Box Text You just found out that Princess Leilani was kidnapped by the Evil Witch Doctor and taken to Adventure Island in the South Pacific. You land on Adventure Island without weapons or food. The island is thick with tropical forest, mountains and caves. Hidden on the island are your skateboard, axe, food and other helpful tools you must find by exploring the island. Better find the weapons and food quickly because you will need them to fight the Witch Doctor's spiders, snakes, bats and demons. The Evil Witch Doctor has set lots of traps for you before you can face him one on one. Are you up for the challenge?! Can you live through Adventure Island to save Princess Leilani?! 10-28-2012 exonerator Box Text You just found out that Princess Leilani was kidnapped by the Evil Witch Doctor and taken to Adventure Island in the South Pacific. You land on Adventure Island without weapons or food. The island is thick with tropical forest, mountains and caves. Hidded on the island are your skateboard, axe, food and other helpful tools you must find by exploring the island. Better find the weapons and food quickly because you will need them to fight the Witch Doctor's spiders, snakes, bats and demons. The Evil Witch Doctor has set lots of traps for you before you can face him one on one. Are you up for the challenge?! Can you live through Adventure Island to save Princess Leilani?! 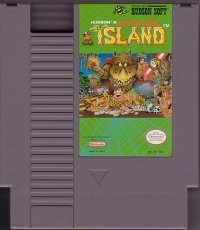 This is a list of VGCollect users who have Adventure Island in their Collection. This is a list of VGCollect users who have Adventure Island in their Sell List. 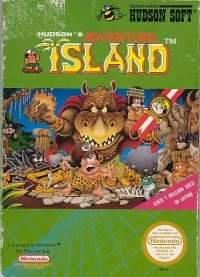 This is a list of VGCollect users who have Adventure Island in their Wish List.